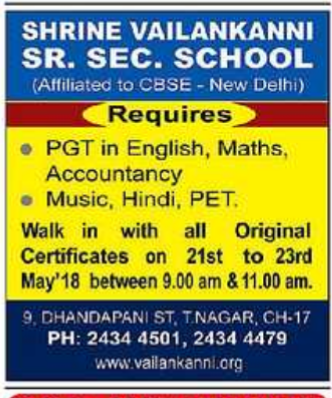 Shrine Vailankanni Sr Sec School, Chennai has advertised in THE HINDU newspaper for recruitment of Teaching,non teaching staffs jobs vacancies. Interested and eligible job aspirants are requested to walk-in interview 21/5/18 to 23/05/2018. Check out further more details below.